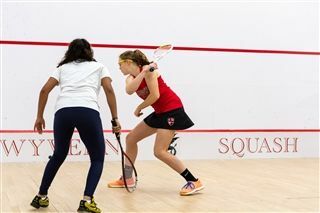 The Kingswood Oxford girls varsity squash team started 2019 just like it finished 2018, with a dominant victory. The Wyverns were back in action on Saturday and posted a convincing 7-0 victory over Millbrook to run their record to 3-0 on the season. The Wyverns did not lose a game in the seven matches against the Mustangs. Kingswood Oxford has won its first three matches by scores of 6-1, 7-0 and 7-0. The one individual match the Wyverns have lost was a close five-setter. The Wyverns have an important stretch of the schedule coming up starting Wednesday when they host Canterbury. Kingswood Oxford is back in action on Thursday when it hosts Westminster. Kingswood Oxford then visits Choate Rosemary Hall on Jan. 16 and is at Kent School on Jan. 19. The Wyverns’ next return home on Jan. 23 when they host Suffield Academy. “The matches in the coming weeks will put the team to the test as we face teams that have historically been a lot more difficult to beat or are a lot more consistently solid.” Biondi said. Against Millbrook, Sydney Smith ’21 and Claudia Petrie '19 kept the team's clean sweep alive by winning intense second games 14-12 in the number one and number five spots respectively. Izzy Berckemeyer '21 impressively dropped only eight points in three games in the number four spot.